A new school term brought new faces to The College of St. Scholastica. Students of all kinds — international, online, transfer and of course, incoming freshmen — made Duluth and our extended campuses their home. Each incoming student, by virtue of acceptance, demonstrates the spirit of our Benedictine heritage, embodying Love of Learning, Stewardship, Respect, Hospitality and Community. And if by chance a student were selected as a representative for our "Community" value, perhaps there would be no better choice than Micaela Jacobson '20 one of two Sister Mary Rochefort Community Builder Scholarship recipients. Jacobson's tuition, room and board are covered at The College of St. Scholastica. "I'm so grateful for and excited about the Sister Mary Rochefort Scholarship. It's making my dream of attending St. Scholastica come true," Jacobson said. "I'm passionate about serving others, building community and helping bring about positive change, and I'm looking forward to doing that at CSS." Jacobson, a native of Minnetonka, Minn., doesn't just serve once in awhile or stick to opportunities in her own backyard. Instead, she is driven to meet needs through her own nonprofit, Youth Hope Rising, which raises funds that support the children she serves at Mary's Place in downtown Minneapolis, and beyond. She's served with her siblings regularly since she was a child. "Youth Hope Rising is dedicated to offering programs that help teach, enrich and empower children living in poverty," Jacobson said. "Our goal is to inspire hope and help kids see bright possibilities for the future." Of course, Jacobson isn't limited to self-fueled endeavors. As an extension of her student government service (from sixth grade through high school), she served four years as the District 3 Representative of the Minnesota Youth Council and Student Advisor for the Minnesota Department of Education. These opportunities exposed her to realities of government that she says will be helpful in the future — especially the unprecedented contributions her group was able to make in allocating funds earmarked for the 21st Century Community Learning Center Grant. "Through the Department of Education, we participated in a review panel to decide where millions of dollars in after-school programming would be best allocated," Jacobson said. "Youth Council was a great group to work with because we were so diverse and came from cities all over Minnesota." When she speaks about her future at St. Scholastica, it's clear Jacobson already has a plan in mind. A job-shadow opportunity in an OB/GYN unit piqued her interest in healthcare, and she believes a career in nursing may be the intersection of her many pursuits. "I was able to spend time with OB doctors, nurses and midwives at Methodist Hospital, even witnessing live births and C-sections," Jacobson said. "Nursing feels like the right fit for me because I love helping people; plus, my grandma was a nurse. I'm really excited about the actual classes, too." As a new Saint, Jacobson is already involved in the Christian Student Community, Intervarsity, Community Service Orientation, Benedictine Friends, Intramural Women's Basketball and hopes to become more involved in the International Club. Now, with her first college semester complete, she is reflecting on further ways to best serve the community. She says she has several ideas underway. "I feel so incredibly blessed to be a part of the St. Scholastica community, it has become my home away from home," Jacobson said. "The welcome support and hospitality that is at the heart of CSS has made my transition to college one of the best experiences of my life!" 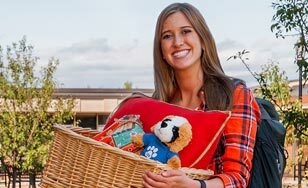 Micaela Jacobson, one of two Sister Mary Rochefort Community Builder Scholarship recipients, made an impact at St. Scholastica even before she arrived on campus. "I was out for a walk in the cemetery and saw what turned out to be Micaela and her mother placing flowers at Sr. Mary Rochefort's gravestone. I spoke with them and discovered they were coming to pay respects without ever having met her. To me, it was further reinforcement that we chose well in awarding Micaela this scholarship."